Starter is back, and with the Super Bowl festivities in full swing, former NFL star Carl Banks, the proprietor behind the resurgence of the Starter Brand, is getting some nice publicity leading up to the big game. Our partners, The Shadow League, conducted an interview with Mr. Banks in October. If you’re between the ages of say, 30 and 42, you likely have fond memories of the Starter athletic company. Back in the late ‘80s and early ‘90s, Starter was a hot ticket. It dominated the fashion marketplace and became synonymous with edgy streetwear, dope sports teams and hip-hops rise into the mainstream understanding. 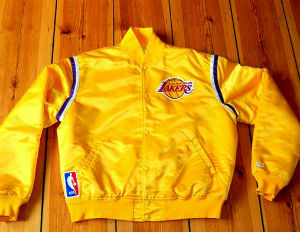 For kids back then, a Starter jacket in 1990 is akin to rocking a Louis Vuitton joint nowadays. You wore it with confidence everywhere you went. However, by the mid ‘90s the label had grown tired, unable to keep up with the burgeoning labels dominating the tastes of young folks. Starter essentially vanished into the ether, only worn by oldheads who never got rid of their original jackets. For anyone with positive thoughts about Starter’s history, the last few months have been promising. Starter is back, with new styles and materials, and is poised to reclaim some of the market share lost nearly 20 years ago. Carl Banks, former Giants LB extraordinaire and president of sports apparel firm G-III, is the person in charge of marshaling Starter’s revival. We spoke to Banks recently about the future of the brand. Watch the video below and let us know your thoughts in the comments.